Bouldering Clinic with Addidas Athlete and Miramont route setter, Ian Dory! 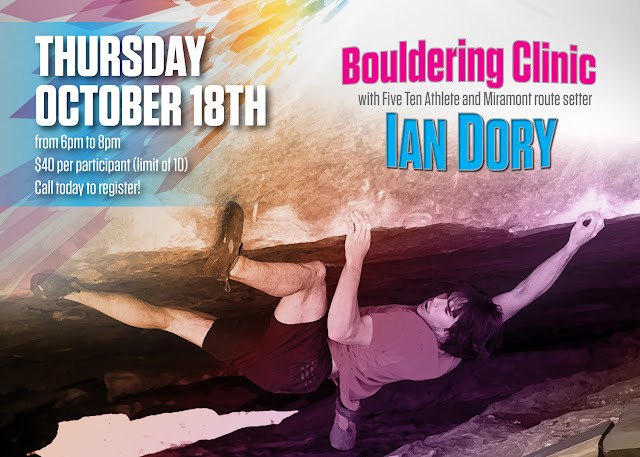 As a professional climber, Ian has estasblished many first ascents and repeated some of the world’s hardest boulder problems. As a Fort Collins, CO local Ian has been at the fore front of new school development in Horsetooth and RMNP. - The 7th Ascent of Dai Koyomada’s Wheel Of Life_V15 in the Grampians, Australia recently featured in Rock and Ice. Learn the mental and physical techniques that have propelled Ian from a hometown crusher to one of the world’s elite. First Female Ascent of V14!